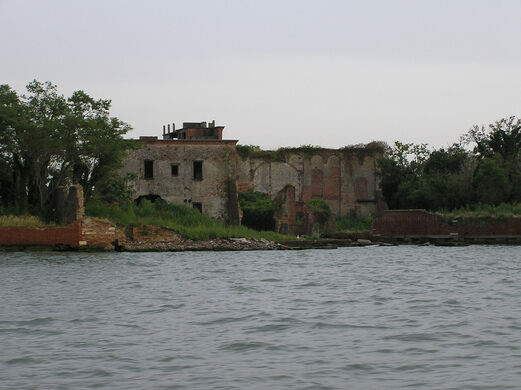 The island of San Giorgio in Alga (awesomely translated as, “Saint George in the seaweed”) has lived a number of lives since humans began building on its tiny, confined shores ranging from being a hotbed of monastic reform to a base of operations for Nazi frogmen, but is now just an abandoned isle dotted by crumbling buildings. The first time humans made their mark on San Giorgio in Alga was as early as 1000 CE when a Benedictine monastery was built on the site. A number of monasteries continued to occupy the island for hundreds of years until the island became nearly deserted in the early 13th century. At this point the buildings were given over to a clerical order that developed and spread such radical reforms as allowing followers of the order to sleep in private rooms. The clerical order survived into the 1700s when a massive fire swept across the island and with the losses they fell into decline. By 1799 a political prison had been established on the island as it was slowly militarized. 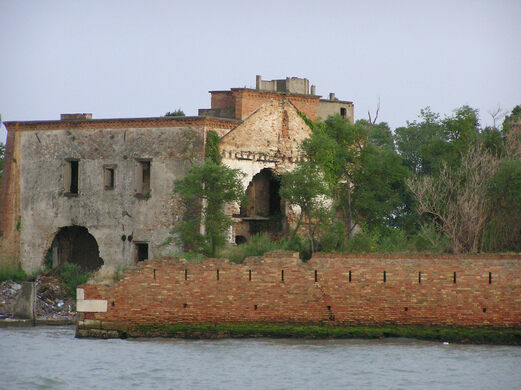 Many Venetians who expressed anti-Austrian sentiment were sent to live on the island which, due to its position right in the middle of the Venetian lagoon, made it increasingly strategically valuable. With the onset of World War I, a number of bunkers were built but not extensively utilized and soon the island was essentially abandoned, or so it was thought. 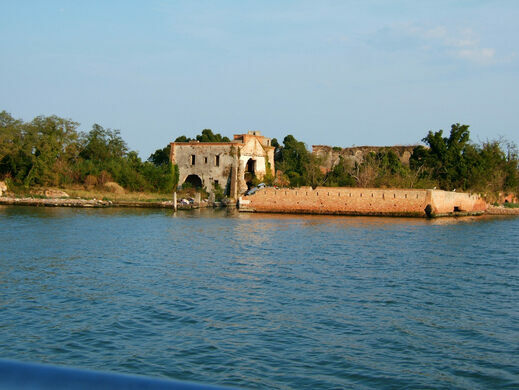 During World War II the encampments on San Giorgio in Alga were used as a secret training base where Nazi divers could learn how to plant underwater mines under the cover of night. However with the end of the war the island was once again abandoned. Today the only military and monastic buildings can still be seen from the shores of the island and some intrepid urban explorers have even ventured in among the crumbling structures. However all of the old military and religious artifacts have been removed finally allowing it pass into its latest phase as just a lovely ruin. All that remains of the fishing-vessel-turned-warship is its weathered hull. The Belgian library displays burned books that were salvaged from the fires of both world wars. The pits used to load the nuclear bombs onto the aircraft that dropped them over Hiroshima and Nagasaki at the end of World War II.